Botox for Kids... Not your Wrinkles! When we hear the word Botox, we automatically think of smoothing wrinkles and lips that don’t move, but Botox or Botulinum Toxin has many medical uses you may not know about! 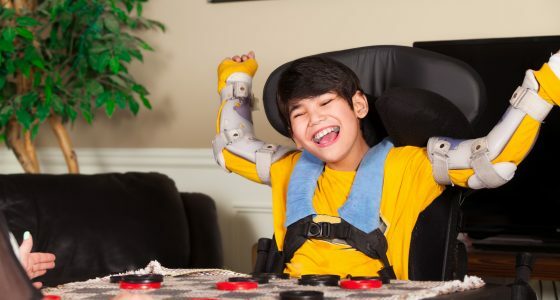 For many years now, Botox has been used to help kids with ‘spasticity’ or 'tight muscles' which may have been caused by Cerebral Palsy, Brain Injury or Spinal Cord Injury. Muscles become tight when there is a continued ‘over activity’ of the muscle, because the injured brain or nerve pathways are continually sending uncontrolled signals telling the muscle to be 'turned on'. This is known as increased tone in the muscle. The muscle can tighten even more, when it is trying to do an activity. When this happens, it can be really hard to move the muscles, affecting speech and body movements and sometimes be very painful. This can impact on the ability to perform day to day tasks like getting dressed, eating, hand writing, and most importantly keeping up and playing with friends and siblings. Before Botox can be used for kids, they need to meet with a Paediatric Rehabilitation Specialist, who is a bit like a Doctor who specialises in how a diagnosis effects your Daily Living Skills, Function and Ability to Participate in Life. This is best done in collaboration with therapists and Parents/Carers. When they see you, they will ask you and your family what your goals are and look at how best to treat the muscles that are too tight and impacting on achieving your goals. Botox injections are just one of the treatments that may be included in this plan. Team team, including you as a family, will will discuss and decide which muscles to inject and dose. Once the Rehab Specialist knows which muscles to treat, Botox is given by an injection directly into the muscle, using an ultrasound machine to guide them into the right place in the right muscle. This will essentially paralyse some of the muscle, allowing it to move more freely. This usually takes a week or two to take full effect, and it is essential to have a plan with your Occupational Therapist or Physiotherapist to make the most of the time your muscles are moving more easily. This may include a therapy program, casting, splinting or a combination.